The perfect knitted cardigan for any vintage truck enthusiast. Homepage. This page: Could any truck enthusiast in the 1950s or 1960s resist wearing this transport-inspired clothing??? Truck clothing - 1950s' style. There are a few obscure motoring-related(ish) items in the Collectables section already, including old petrol station receipts, Mickey Mouse hankies and these original Austin of England touch-up paints found in a scrap A35. So adding this 'find' to the site didn't seem entirely out-of-place. Dating to the 1950s or early 1960s is this groovy knitting pattern for a cosy woolly cardigan, featuring on its rear a chunky truck. 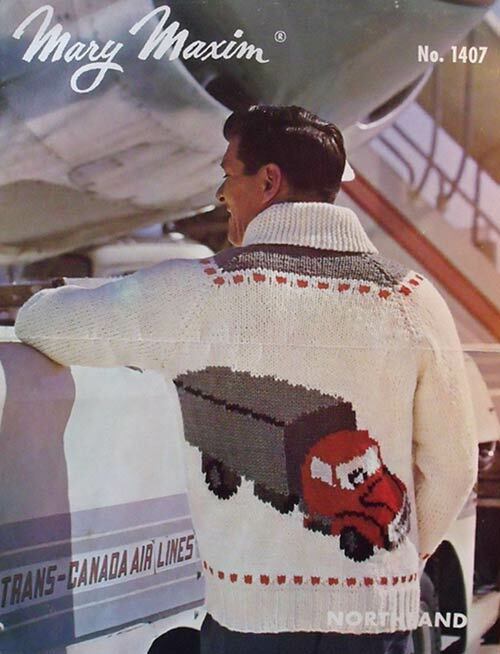 I'm sure no self-respecting enthusiast with an interest in old trucks, or more correctly lorries, could resist purchasing a copy of this pattern and begging a friend or relative to get their needles out and create this fine garment for them. Truckers and enthusiasts up and down the US of A and Canada must have revelled in its cosy warmth during the sixties. The model in the photograph, flown out to the location courtesy of Trans-Canada Airlines it says inside, is seen posed beneath one of their aircraft, leaning casually on a TCA ground starter. Quite how the airline became linked in with this is anyone's guess. Trans-Canada Airlines operated a number of the "classic" types, including my own favourite, the Lockheed Constellation. Perhaps someone can identify the aircraft in this photo from it's engine cowling?